Nothing makes my mouth water more than cottage cheese dip! Dips are my guilty pleasure, so when I figured out how to make one of my favorite dips, cottage cheese dip, healthier, I was over the moon! Dips have the magical ability to transform something bland and dry into a flavorful snack. This cream cheese dip is everything I love — creamy, cheesy and a great onion flavor! For all you other dip fiends out there, I recommend trying our Million Dollar Dip, Easy Fruit Dip or Slow Cooker Queso. We love this Mexican Street Corn Dip as well. What is Cottage Cheese Dip? What is this delicacy that we call cottage cheese dip? It’s a delicious low-fat dip that tastes too good to be healthy (but it is!). 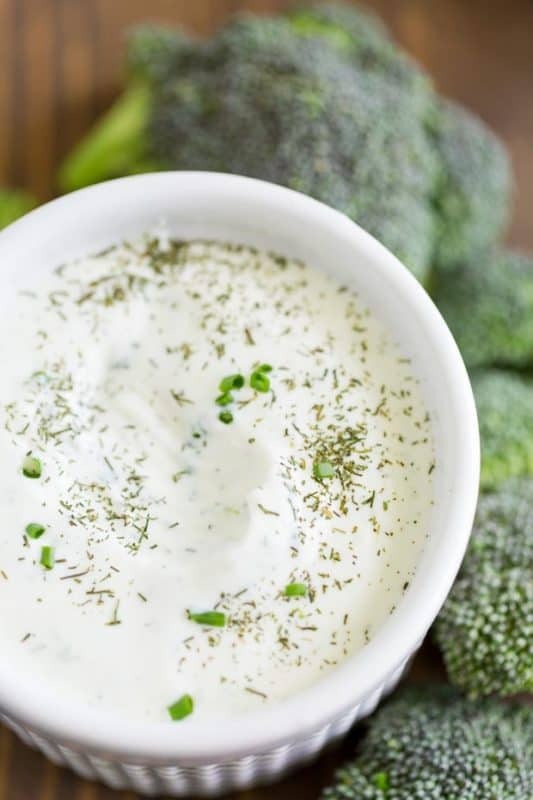 This dip is a mixture of cottage cheese, garlic, onion, chives, dill, and mayo. Sounds good so far, right? All of the ingredients in this cottage cheese dip are there for one reason and one reason only – to pack a flavorful punch! There isn’t one single ingredient in this cottage cheese dip recipe that I don’t love! And what makes it even better is that all these ingredients are healthy. Who would have thought that eight little ingredients could be transformed into such a delicious dip. TOP TIP – if you want to make this cottage cheese dip even tastier, try using fresh onion and garlic instead of onion and garlic powder. Trust me when I say it really makes a difference! 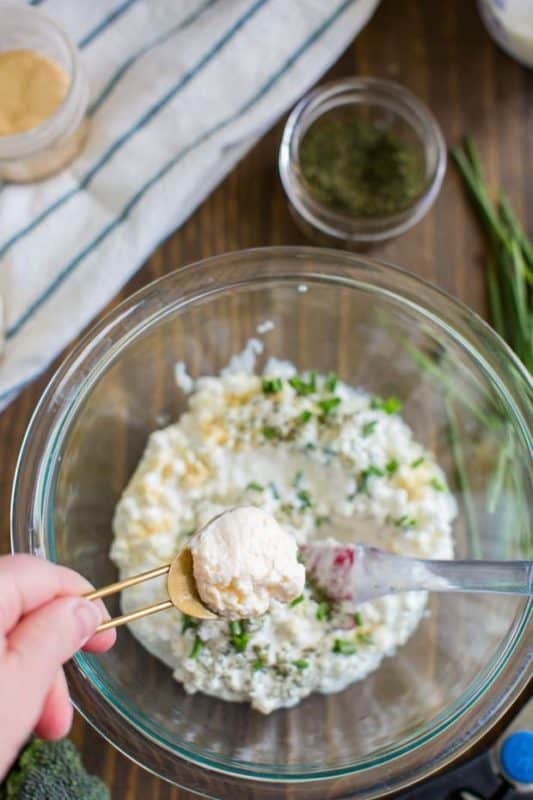 Making this cottage cheese dip from scratch is so easy that it almost feels like you’re cheating! All you need to do is place all ingredients in a food processor/blender and blend until smooth… No, I’m not kidding, that really is it! Now you see why I love it so much! You’ll never reach for shop bought dip again now you know how to make your very own cottage cheese dip! I love experimenting with healthier recipes. I’ve made a commitment to myself to cook one super healthy meal each and every day. I’m not going to lie, it’s something that I actually quite look forward to, but it’s not without its challenges. Primarily because I’m a food blogger and I LOVE food. 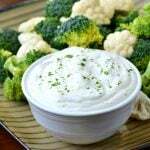 This super yummy “ranch” flavored cottage cheese dip recipe is a winner every time. 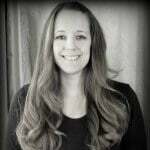 Even as a super busy mama, I’m a sucker for dip and need my dip fix! There are so many things that you could serve with your homemade cottage cheese dip to turn it into a fully fledged appetizer! You could serve your homemade cottage cheese dip with fruit and veggies to make a healthy snack. Some of my favorites are sliced banana, pineapple chunks, berries (blueberries, strawberries, raspberries and blackberries), melon, avocado, canned peach slices and apple slices. Another of my favorite uses for this cottage cheese dip is to stir it into a pasta dish. The hot pasta makes the cottage cheese warm and creamy. Add plenty of fresh black pepper for the best results. My kids love baked potatoes. This cottage cheese dip can make a whole meal when you serve it on a baked potato with some fresh salsa. If that doesn’t scream quick and healthy dinner, I don’t know what does! Getting bored of plain old buttered toast? This cottage cheese dip recipe can be used to make breakfasts great again. Spread it on some toast or better yet, add it to your scrambled eggs for a protein loaded breakie! If you like a bit of heat, you can season your cottage cheese dip with your favorite blend of spices. 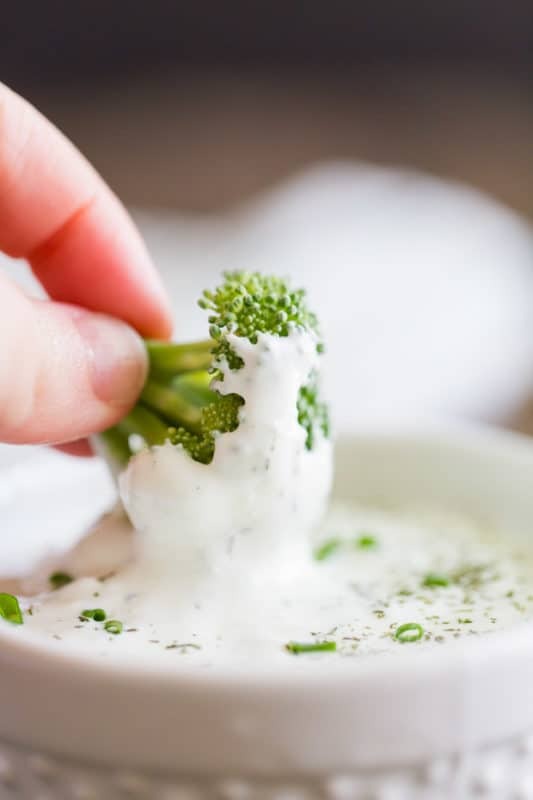 This cottage cheese dip is a perfectly healthy substitute for traditional sour cream and horseradish dips and there’s so much more that you can do with it! One of my favorite family meals is buffalo chicken wings. Cottage cheese dip is the best condiment to serve with this meal because the creaminess compliments and cuts through the heat of the buffalo sauce. Recently, I’ve even started adding a helping of my homemade cottage cheese dip to spicy tacos! Don’t knock it till you’ve tried it! Your homemade cottage cheese dip will keep for 5-7 days in the refrigerator in a sealed pot (if it doesn’t all get eaten before then!). You can also make extra servings of this delicious dip and it will keep in the freezer for 2-3 months. Do not heat your cottage cheese dip to defrost it. Leave it in the refrigerator to defrost overnight. Is Cottage Cheese Dip Healthy? I find that people either love or hate cottage cheese dip. Personally, I love it! I have been a huge fan ever since I discovered it and my affection for this healthy dip has only grown over the years. Cottage cheese dip is not only super tasty, it’s incredibly healthy and is largely regarded as a diet food. For every 4 ounce serving, there are 14 grams of protein and so long as it’s made with lowfat or nonfat ingredients, it’s low in calories too. Who says you can’t have your dip and eat it!? 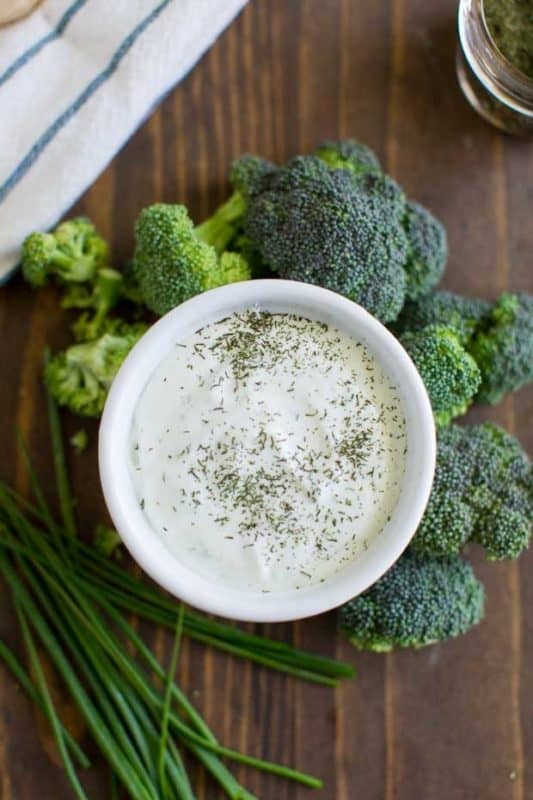 This quick and easy cottage cheese dip recipe is the perfect snack food if you’re looking to lose weight, maintain a recent weight loss or incorporate it into a regular healthy diet! It’s delicious and even kid friendly! This Skinny, Quick and Easy Cottage Cheese Dip recipe is the perfect snack food if you're looking to lose weight or maintain a recent weight loss! It's delicious and even kid friendly! Place all ingredients in a food processor / blender and blend until smooth. This is my version of a Medifast Lean and Green Recipe. Please verify you are consuming the correct amounts prior to making this recipes if you are on the Medifast 5 & 1 program.